Apple was rumoured to be working on a couple of new Apple Watches in the lead-up to the Worldwide Developers Conference here, but that didn't come to fruition. However, there will indeed be a version of the wearable that will be new to the UAE coming very soon: the much-awaited cellular option. While Cupertino-headquartered Apple did not announce this at WWDC18, the Apple Watch Series 3 with cellular will hit UAE stores on June 15. Pre-orders begin June 8. Apple introduced the cellular-enabled device last September. It will allow users to make calls, send messages, stream music and other actions without the need for an iPhone. At present, it is available in only 20 countries, including India, the availability of which started on May 11. Users shell out an additional fee to use it. As at posting time, etisalat is already promoting the device on its website, but no pricing was provided. Du has yet to do so. The Apple Watch Series 3 with cellular will be priced starting at Dh1,679 for the 38mm version and Dh1,784 for the 42mm option. 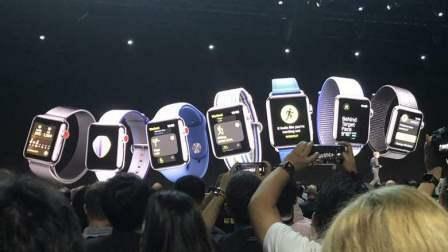 At WWDC18, Apple CEO Tim Cook touted the success of the Watch, saying that it had enjoyed 60 per cent growth in 2017.